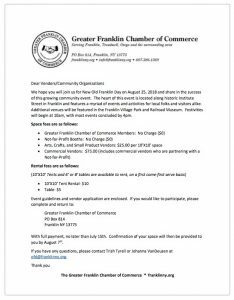 We hope you will join us for New Old Franklin Day on August 25, 2018 and share in the success of this growing community event. The heart of this event is located along historic Institute Street in Franklin and features a myriad of events and activities for local folks and visitors alike. Additional venues will be featured in the Franklin Village Park and the Franklin Railroad and Community Museum. Festivities will begin at 10am, with most events concluded by 4pm. Send application and payment by July 15th. Confirmation of your space will then be provided to you by August 7th.